First, let’s address why so many taxpayers are seeing unexpectedly high tax bills. When the Tax Cuts and Jobs Act was implemented, it eliminated a major deduction that many taxpayers rely on, known as the personal exemption. This allowed people to reduce their taxable income by a set dollar amount per dependent (including themselves) on their tax return. The loss of this deduction greatly impacted families with multiple children, who will see a large increase in tax liability for 2018. Additionally, the withholdings on paychecks for W-2 earners were reduced with the implementation of the new tax law. While this may have meant a bigger paycheck for you, it also meant that less was going to the government than normal, which leads to a bigger tax bill when you file. Both of these major changes have left taxpayers reeling when they calculate their tax liability for 2018. The majority of options for reducing your tax liability expired on December 31st. However, there is one quick option still available to many taxpayers to reduce your taxable income, and therefore reduce your tax bill. Contributions made to qualifying retirement plans can be deducted so long as the contribution is made before April 15th. So, if you haven’t maxed out your IRAs for 2018, doing so right now could be a quick way to hold onto more of your money and reduce what you owe in taxes. 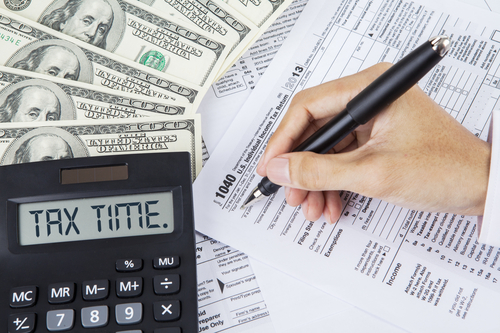 If you still owe a large amount in taxes, you may be tempted to avoid filing your tax return. Do not do this. Many taxpayers are under the false assumption that filing the tax return somehow alerts the IRS to your tax debt; so, if you don’t file, then you won’t have to pay. This is not true. Regardless of whether or not you file your return, you will owe this debt to the IRS. Failing to file simply adds late filing fees to your existing tax debt, costing you more money in the long run. It is always best to file your return, regardless of how much you owe. It’s also important to note that filing an extension does not push off payment on your tax debt. When you request an extension, you are expected to make an estimated payment on what you owe, even before you file your full return. What you may not know is that the IRS is typically very willing to work with taxpayers and set up payment plans to help them handle large or unexpected tax debts. So, if you’ve found yourself with a large tax bill that you weren’t expecting, speak to one of our accountants about requesting an IRS payment plan. There are many different kinds of payment plans available, but frequently, the IRS will allow you to select your monthly payment amounts yourself, so that you can settle your tax debt without overextending your finances. Primarily, the IRS wants to see that you are making a proactive effort to settle your tax debt. If you reach out, make a good faith payment of whatever amount you can afford, and make ongoing payments on a tax payment plan, the outcome will be much better than if you simply did not file and did not make any tax debt payments. If you’re looking for some last-minute help with your tax return, need to file an extension, or want professional help with requesting a payment plan, please reach out to our offices today. The tax deadline is only about two weeks away, so time to make changes to your return or file without fees and penalties is quickly running out. Call us today to learn more about our tax services and what we can do to help you with an unexpectedly high tax bill.